Maybe that extra fullness beneath your chin is something you’ve had your whole life, something that developed over the years or something you noticed recently. This may be a condition called submental fullness, or “double chin”. At Clear Sky Medical we’ve introduced our latest service Kybella to target the chin and improve our full range of Medical Aesthetics services. One in Four Adults was bothered by their double chin in a recent online survey. While a proper diet and exercise help control weight gain and reduce fullness under the chin, genetics and aging can cause the formation of the “double chin” irregardless of how much weight you loose. Kybella may help. Whether you have a moderate amount of fat under your chin-or a bit more-ask about Kybella. Kybella is individually tailored, injectable, and permanently destroys fat cells in the treatment area under the chin. 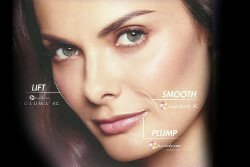 See more before-and-after result photos at MyKybella.com. Kybella is the winner of the 2015 Allure Best of Beauty Breakthrough Award. When injected into the fat beneath the chin, Kybella permanently destroys fat cells. Your body’s natural metabolism then processes the fat cleared from the treatment area. Once the fat cells are gone, you’re left with a noticeable reduction in fullness under the chin. The injection process for Kybella takes from 15-20 minutes. At Clear Sky Medical we may use cold packs or local anesthesia to help make you more comfortable. While you may be excited to see results right away, it’s important to be patient. Allow your body time to process the fat cleared from the treatment area after each visit. For allergy and side effects visit the Kybella website, or talk to staff at your consultation. It’s important to discuss your aesthetics goals with Dr. Meier during your consultation. Tel: 303-790-7860.